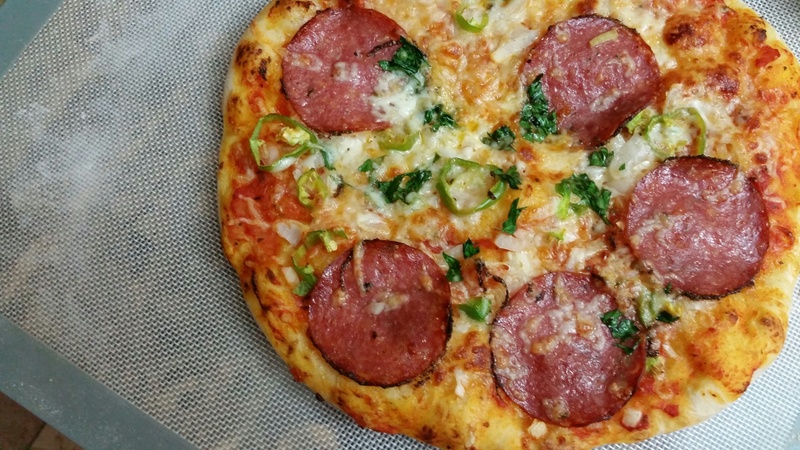 Making pizzas at home is a fav fun-filled family weekend activity, that my family is always game…and once you start making them, you’ll get absolutely hooked too! Light, crunchy crusts with imaginative toppings that are tailor made to your personal likings….Can they even begin to compare with the greasy takeout versions! As you pick up a slice…turn to examine the base…the air pockets baked into the crust give the pizza the delightful sought after crrrrunch! 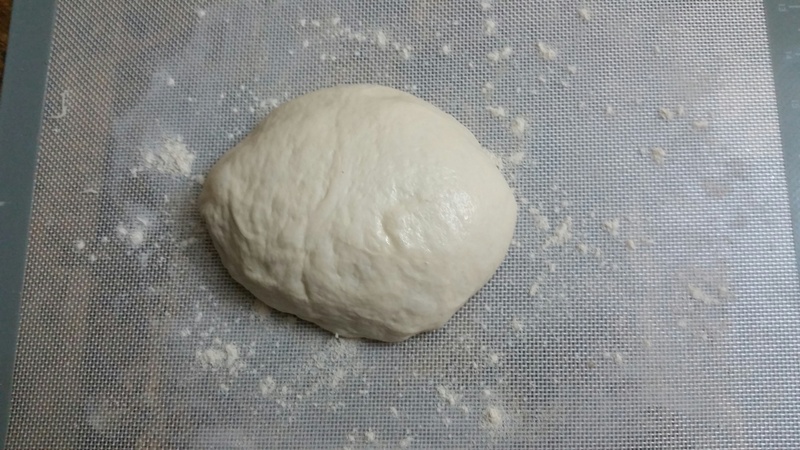 And it all begins with making the right dough! 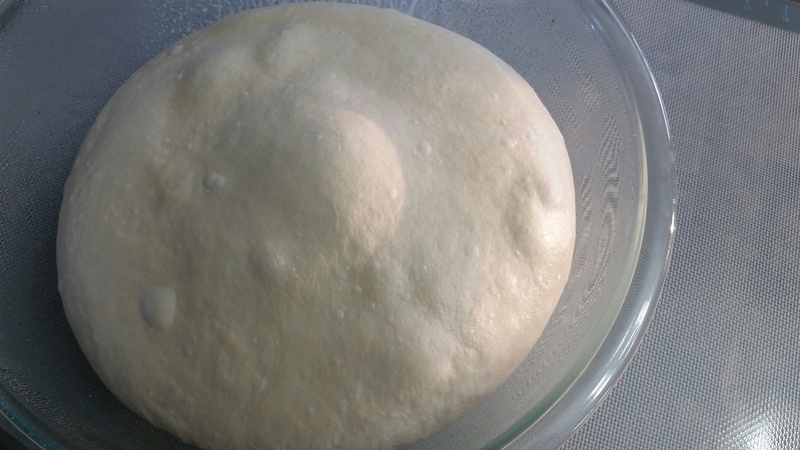 Step 1: Make the Pizza dough using link below. 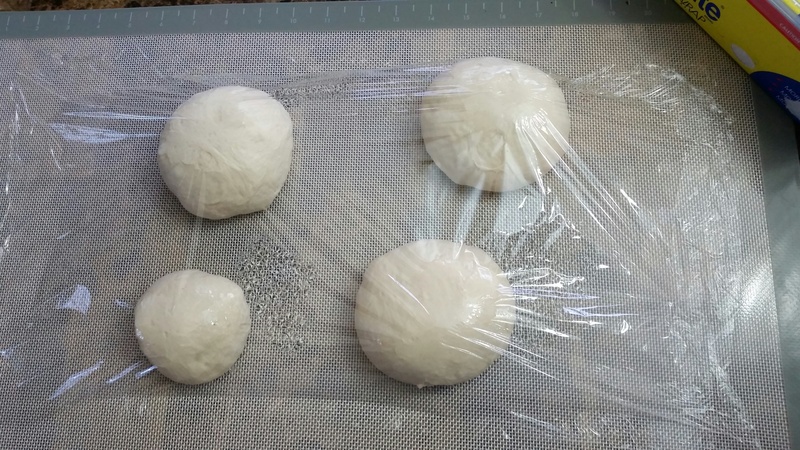 Step 2: Cover the dough with plastic wrap and rest for 2 hours in the fridge for a slow rising. 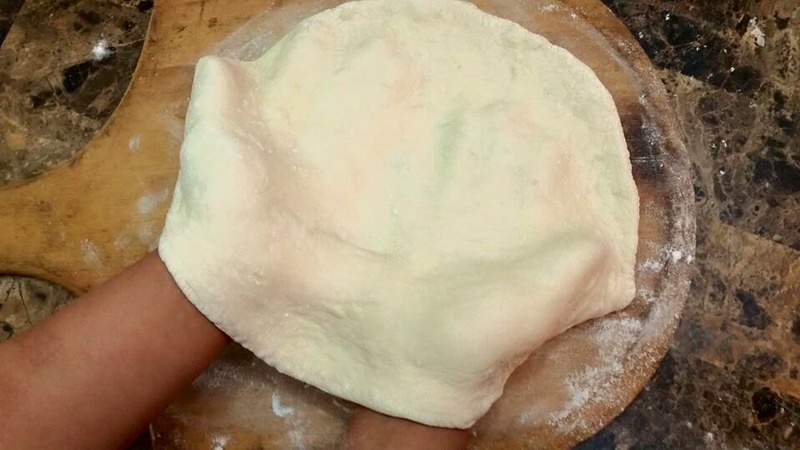 Take the risen dough out of the fridge a couple of hours before you are ready to make your pizzas. Press gently with finger tips to check how well it’s proofed. It should feel light airy and puffy to touch. 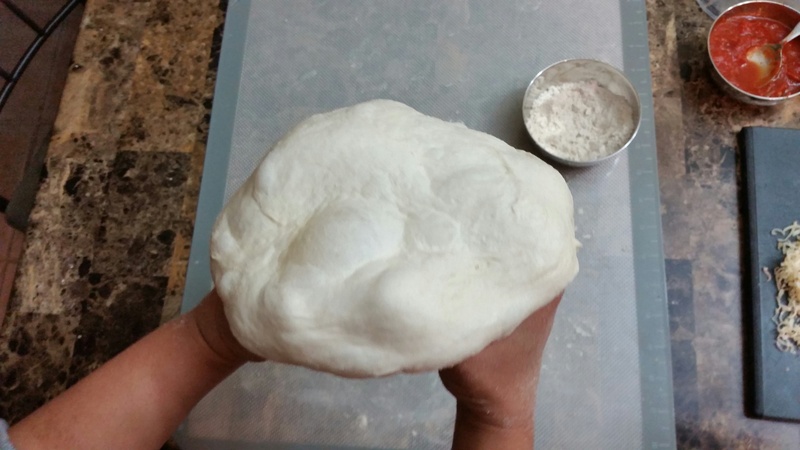 Divide dough into 8 oz portions for medium side pizzas and 3 oz for personal pan pizzas. 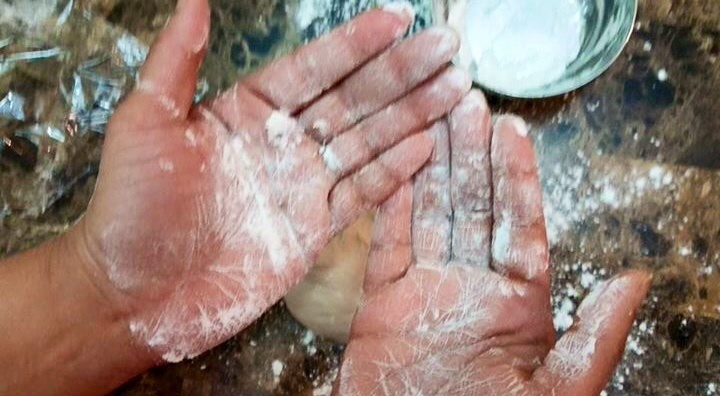 Now using your palms from each portion into tight balls. 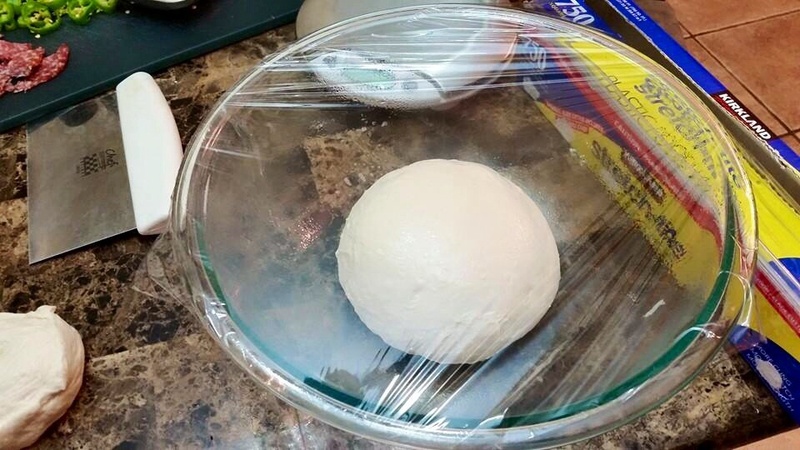 Cover with plastic wrap and leave aside to come to room temperature. 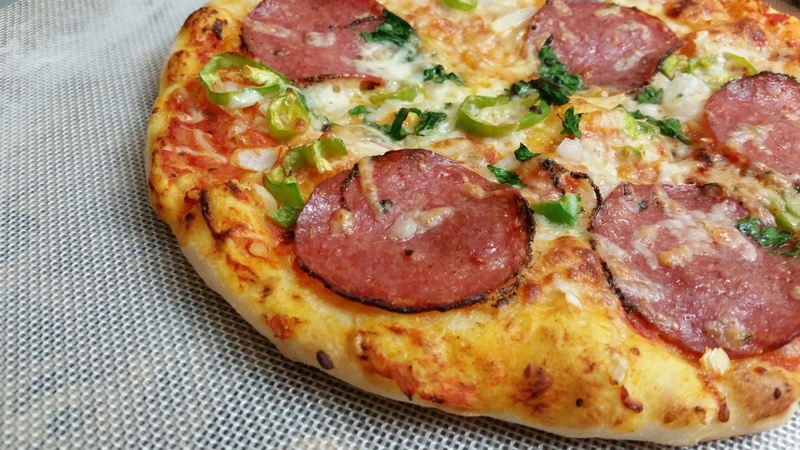 Preheat your oven to max temperature setting along with the pizza stone (if using). 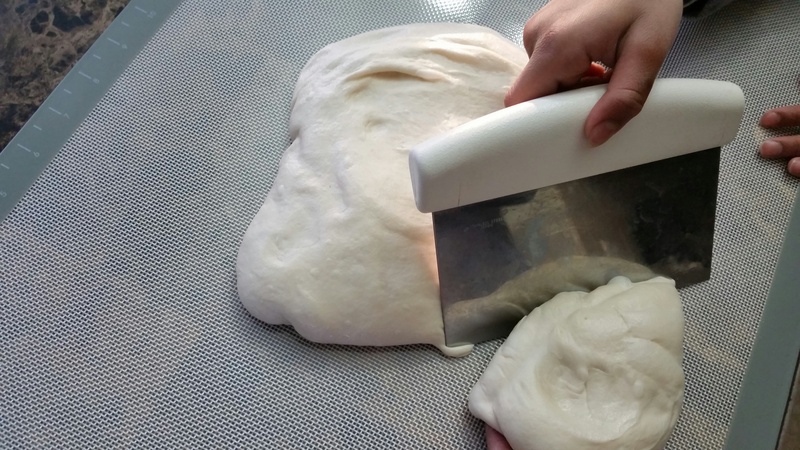 Once the dough balls come to room temperature….Transfer each dough to a lightly floored surface. 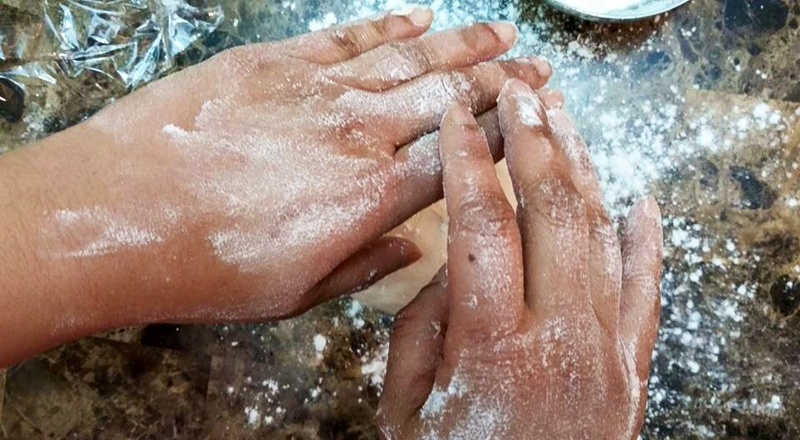 Also rub some flour on your palms and back side of your hands. 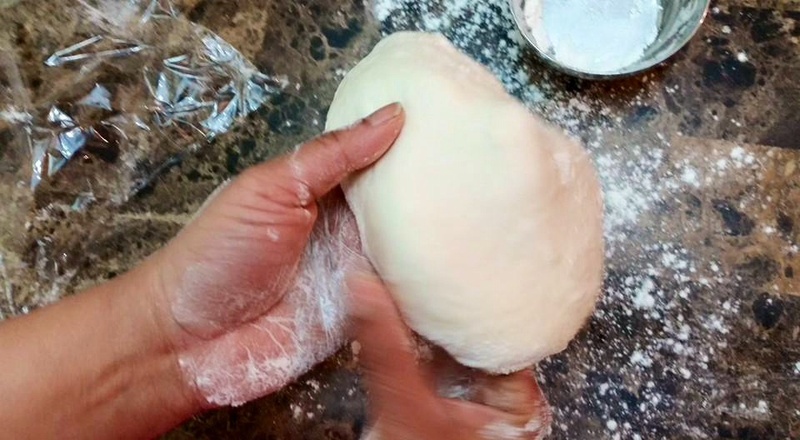 Now take a ball of dough and using your hands gently start to shape it into a circle. 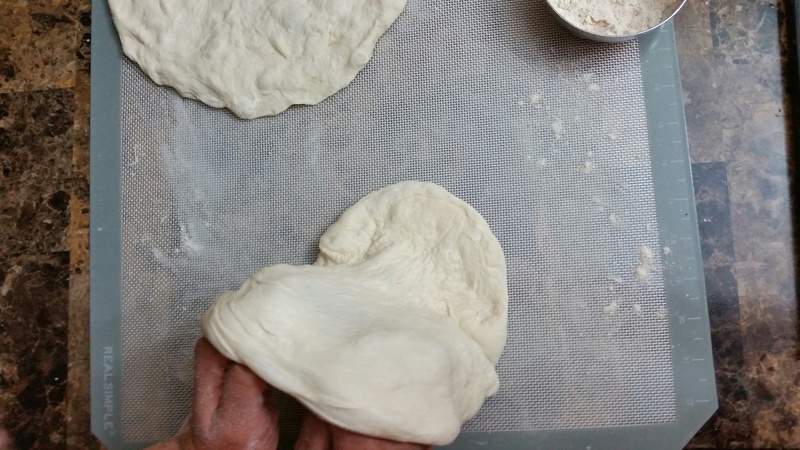 Do not stretch it too hard or you will start to tear the dough. 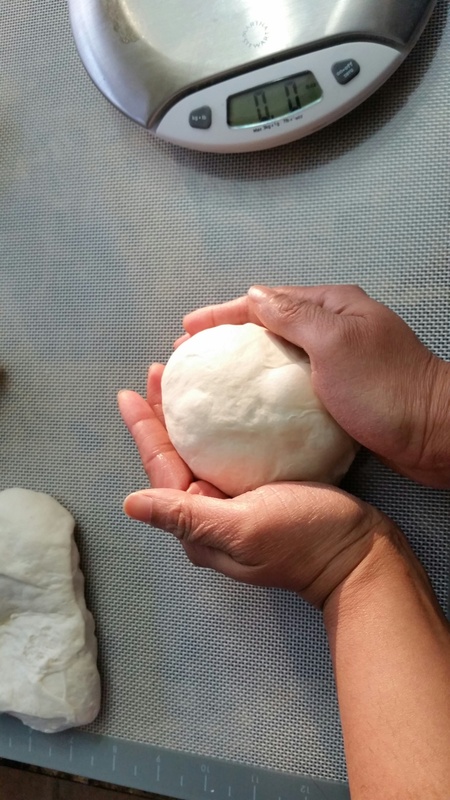 and using your knuckles coax dough into a larger thinner circle. 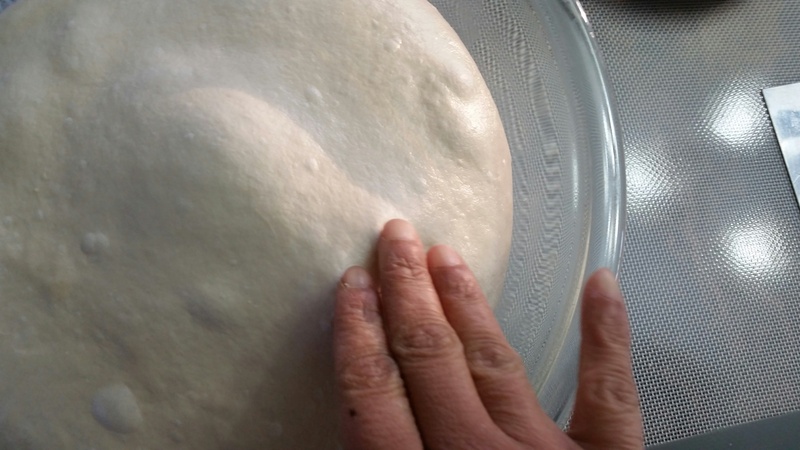 Be careful to spread dough evenly along the entire circumference. 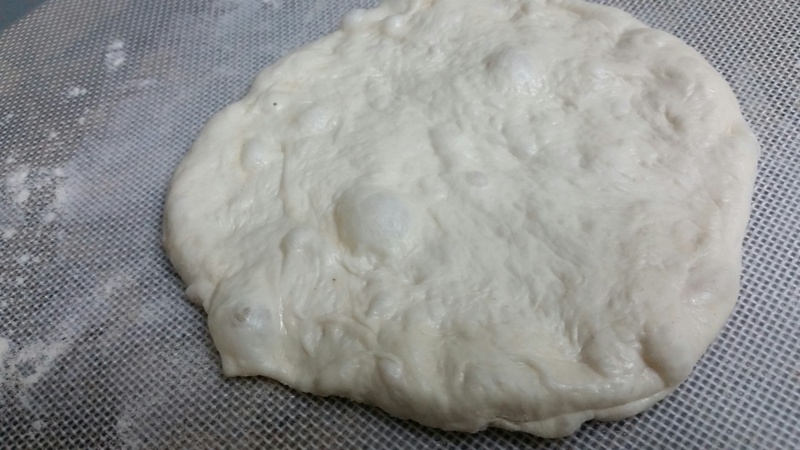 You will see that it is quite puffy and full of air bubbles…that is a sign if a good pizza dough. 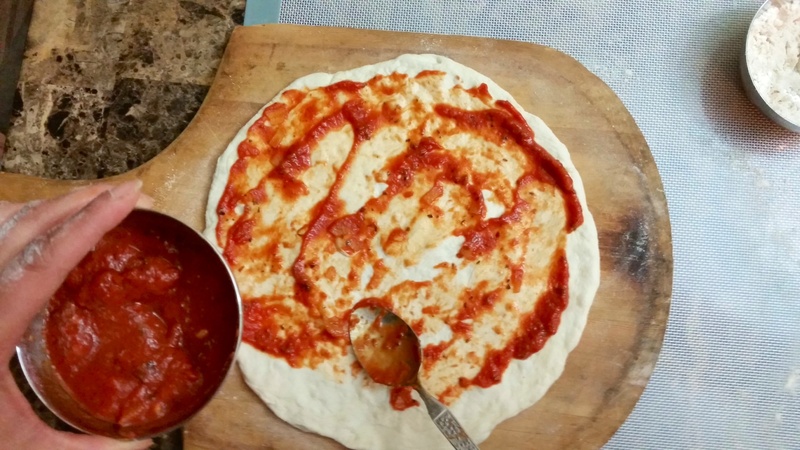 Do not use a rolling pin to spread your pizza…it will pop all the trapped air and give you a dense pizza crust! 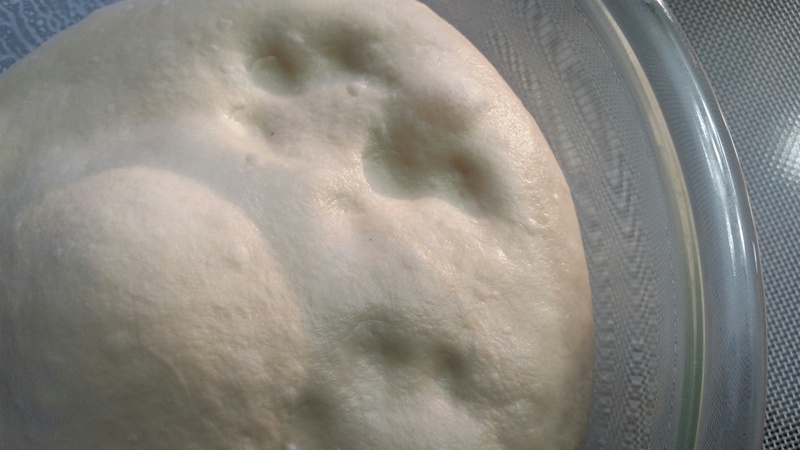 Carefully transfer pizza to a lightly floured pizza flip. 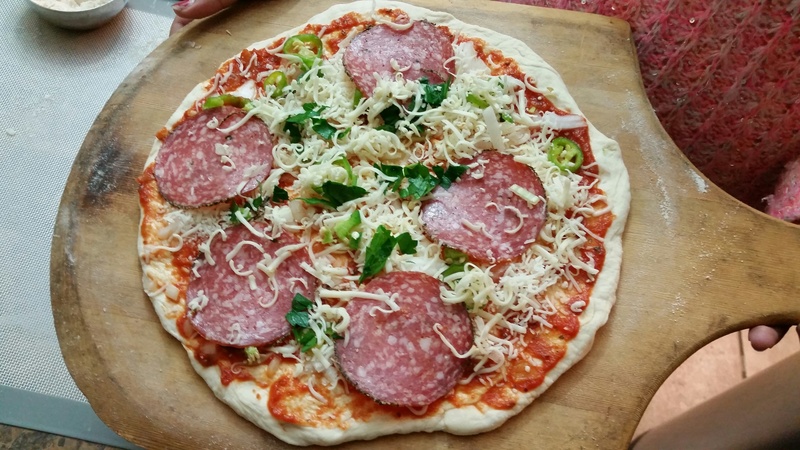 Have ingredients for toppings absolutely ready and spread them on top of pizza as quickly as you can. You want to move quickly. 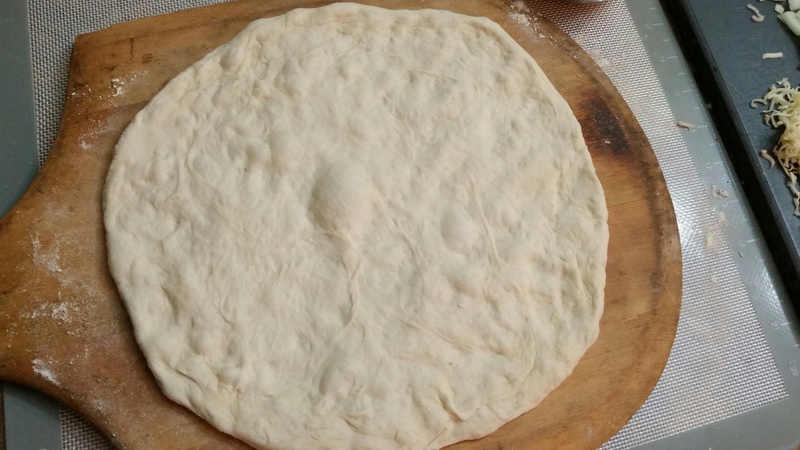 The longer the spread pizza dough stays on the wooden flip, greater are the chances that it might stick to its surface. toppings and cheese. I’ve used Trader Joes organic marinara sauce, some peppered Pork Salami and low moisture reduced fat Mozzarella cheese and some freshly chopped parsley. 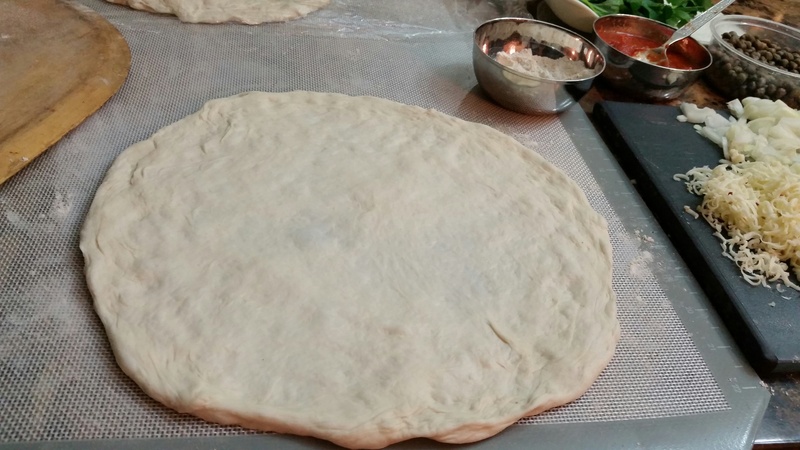 If you do not have a flip you can spread your pizza on a parchment paper or greased sheet of foil placed on a baking tray. 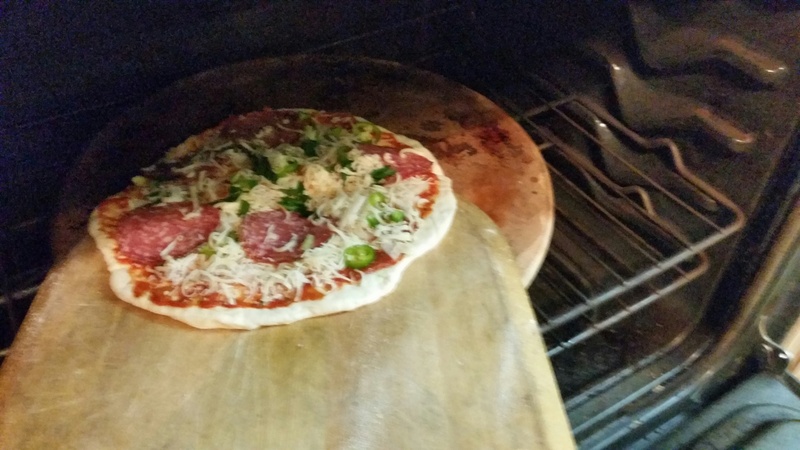 Now gently slide the pizza on the hot preheated pizza stone. Alternatively place the baking tray in the bottom rack of your oven. 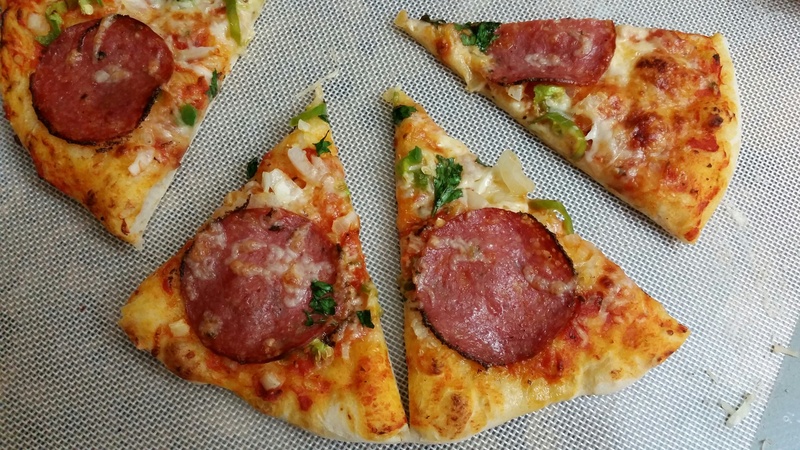 Bake pizza on max heat for 7-8 min (if using a stone) or 10-12 min if using a baking tray. Check mid way to see, if you need to rotate it. 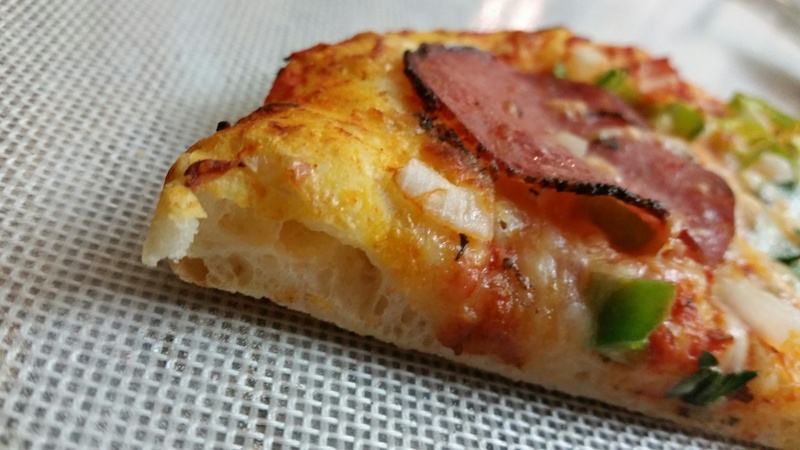 Cook till the cheese melts and the outer crust is golden crisp. 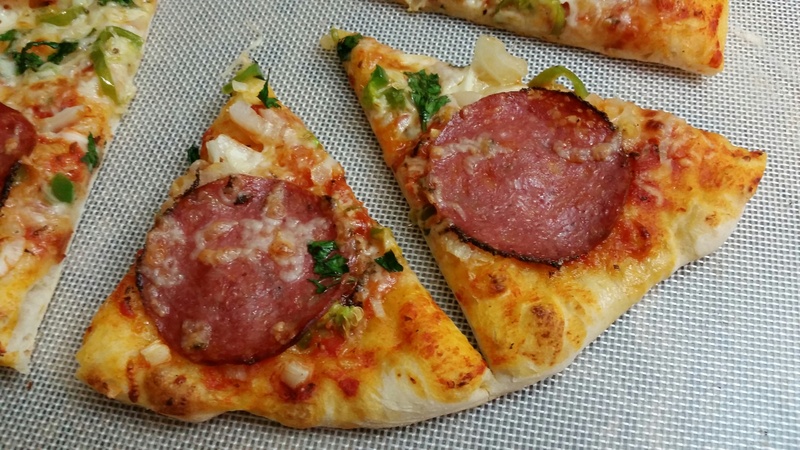 Using flip, take the pizza out of the oven. 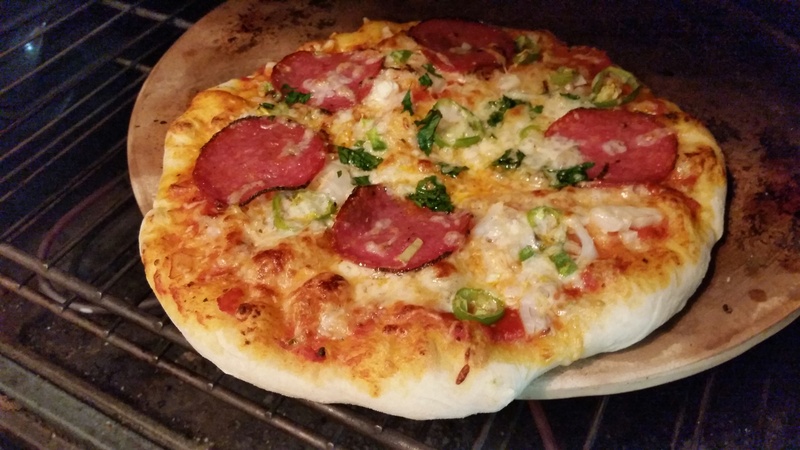 Reminder Note: Pre-heat pizza stone atleast 1/2 hour before baking pizza as follows…. Switch oven to 450 F.
Let the stone heat slowly as the oven heats up. 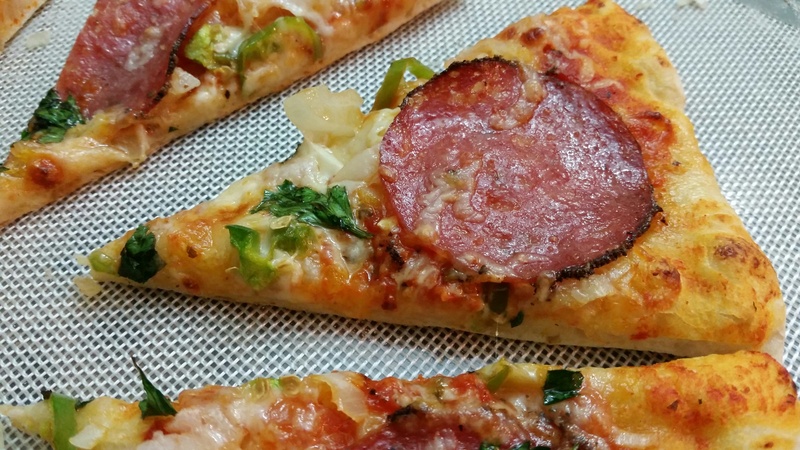 Beware: Never place cold pizza stone in hot oven…the sudden change in temperature can crack your pizza stone!